Sold by PBK Retails (2.7 out of 5 stars | 36 ratings). 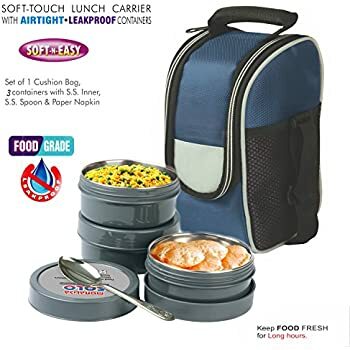 Now get this BMS Executive lunch pack series with soft pack for carrying complete lunch. Presenting BMS Executive products That are made of sturdy Quality stainless steel containers for storing food free from any health hazard and fresh for long hours. - BPA free (Safe for health) - Polypropylene containers. - jacket to store any food sachets, for keeping fork & spoon. 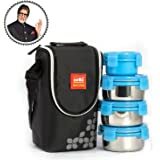 - Easy to carry Light Weight & handy lunch carrier. 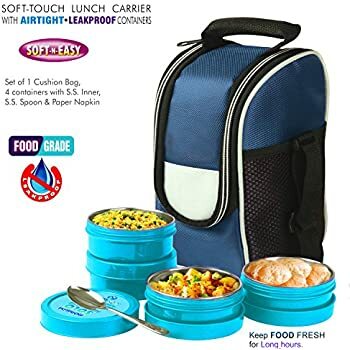 - Compact lunch box to carry full meal. Please don't buy this product and quality is worst/ not good . 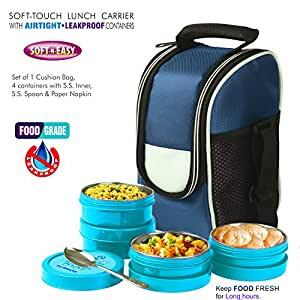 I have buy this product in July 2017 but not using at time and now I have start using this lunch box quality is worst. After closing the thread lock (cap) of the box While lifting or press side of the box cap it's opening after the locking thread cap also. So please advising to check product immediately and use, so you have time to return.. Better go to shop review and buy most better way. 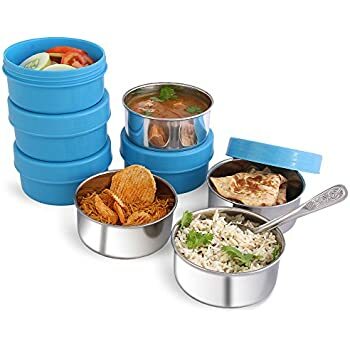 The four container tiffin box appears small. However, for the past few days, I have been taking my lunch in this box. The quantity is absolutely fine for me and it must be so for most adults I would say. 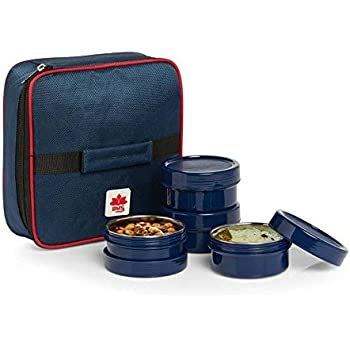 4.0 out of 5 starsLunch box to keep food warm for 4 to 6hrs. Very good. Keeps food warm. Steel containers makes it hygienic. Slim bags make it easy to carry. No leakage or damge. No option to keep the spoons and hand tawels make it one star less. 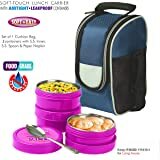 Very good lunch carrier for office and schools. Nice product. Easy to use and handle. material quality is good. but do remember that it is not a hot case. so it can't maintain the warmth even for 2 hours. Product is good and the design is nice. Good for 2nd and 3rd grade school children. The containers are too small. Not good for lunch. okay for breakfast. Very small like a curry box,image is too misleading.self return only.better to choose another.